The Middle East and North Africa is a region known for authoritarian innovations. Their menu of institutional manipulation and political engineering is extensive, and will soon feature yet another innovation. Authoritarian republics are setting the stage for a new political system: "hereditary republics." This is of course not without precedent in the region following in the footsteps of Syria's late Hafidh al-Assad, who bequeathed the Syrian republican "kingdom" to his son Bashar. Several aging dictators are positioning their offspring for an eventual changing of the guards. In Egypt, it's Mubarak's son Gamal; in Libya, it is Qaddafi's son Saif al-Islam. Now it is Tunisia's and Ageria's turn. 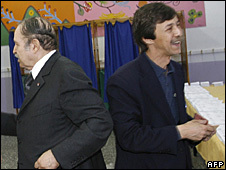 It is rumored that Algeria's Bouteflika is grooming his brother Said for power. As for Tunisia, allegedly increasingly under the sway of Ben 'Ali's wife Leila Trabelsi, it is Sakhr al-Materi son in law of Ben 'Ali, who is favored to succeed the aging and ailing president.